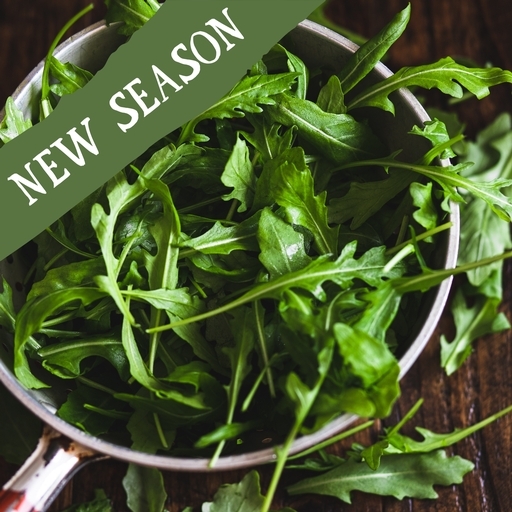 Peppery rocket leaves for fresh salad. We grow it outdoors; flea beetle is a real menace, but if the seedlings survive its attacks, plants can be cut two or three times from late summer onwards. Pile onto a freshly baked pizza, toss with balsamic dressing, or whizz into a piquant pesto. For an elegant salad, combine with salty Parmesan and prosciutto. Try it with pasta; cook and drain the pasta and dress with a little olive oil or butter before mixing in the raw rocket leaves, which should wilt over the pasta. Great with a crumbling of feta cheese. Rocket pesto can be made by substituting the basil for rather less rocket; the peppery bitterness of the leaves goes well with the salty Parmesan or Pecorino. Rocket has a short shelf life and should be kept in a plastic bag in the fridge and eaten as soon as possible. Wash before eating. Grown outdoors from May to November. Germination can be tricky and the flea beetle is a real menace - if the seedlings survive its attacks, plants can be cut two or three times from August onwards.